Brasserie Malmaison in the Malmaison Hotel in Clerkenwell has a lovely little spot overlooking the adorable greens of Charterhouse Square. A self-styled luxury hotel, the Victorian exterior of the hotel is charming and inviting. The limited road access to the hotel also helps to ensure low noise levels. Once inside, you hit the lobby, and to the right are stairs leading down to Brasserie Malmaison in the basement. In contrast to the exterior, the restaurant’s décor looked tired and the lighting could have been better. 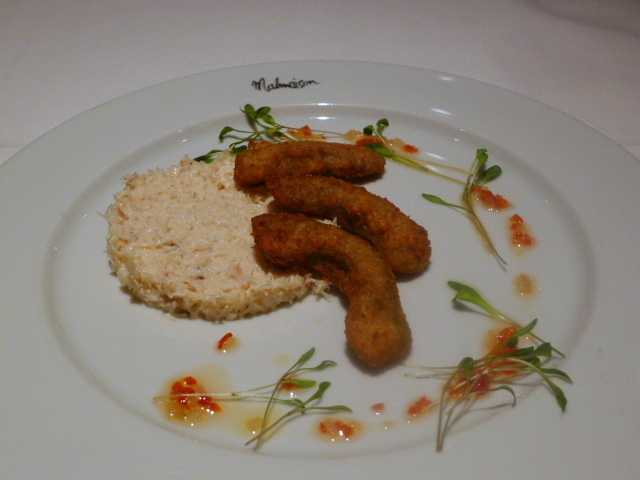 We started with a reasonably priced Cornish crab starter (£9.50). There was a lovely fresh, sweetness in the crab which had been dressed with a mint and shallot dressing. However deep-fried avocado fritters proved bland. The dish would have worked better with a no-frills simple accompaniment of ripe avocado. From the specials, squid with chorizo (£6.95) went down less well. 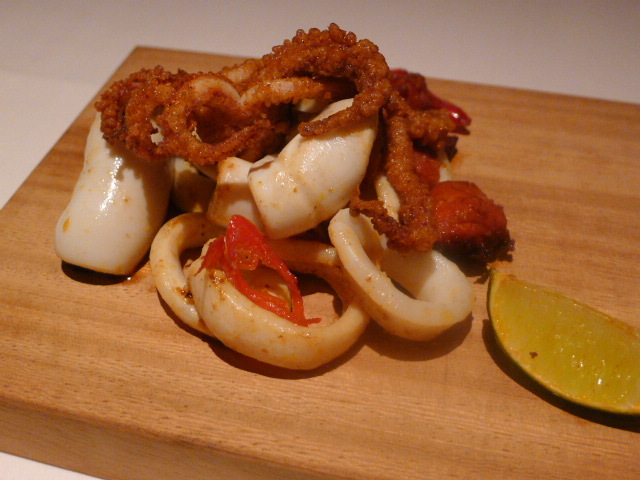 Containing both deep-fried and grilled squid, the former was tender whereas the latter was overdone and chewy. Furthermore, the chorizo did not pack a deep smoky flavour. I usually dread ordering chicken at a restaurant as it typically lends itself to being overdone. 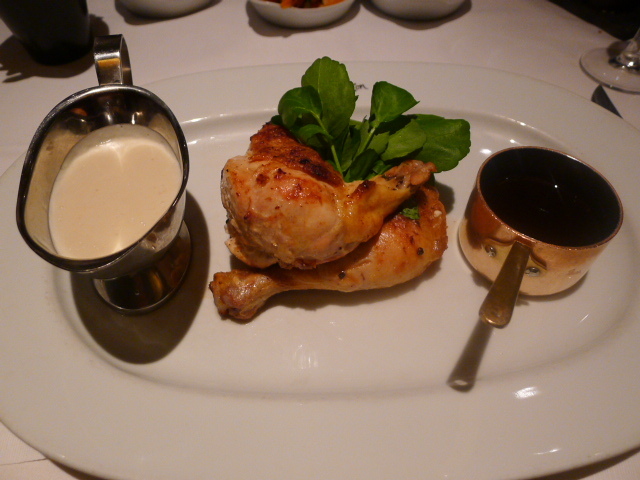 But the half roasted Normandy chicken (£14.95) proved to be rather moist and tasty. The accompanying bread sauce was bland however, and there was a hint of bitterness in the roasting juices. 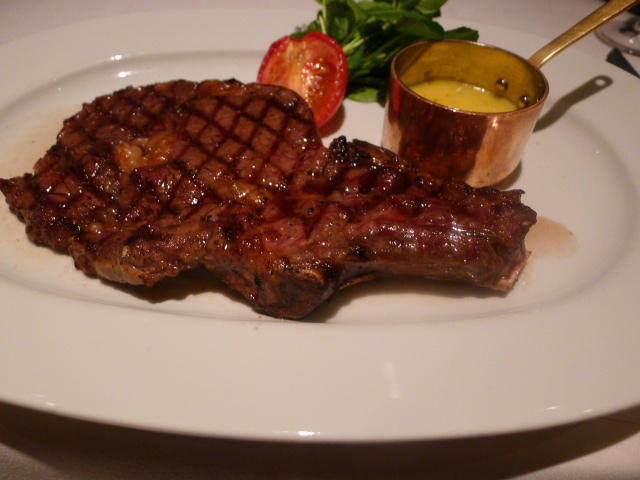 Côte de boeuf (400gm) – dry aged prime rib steak served on the bone (£27.95) was tender and satisfying. But being quite thinly cut, it erred more on the side of medium than the requested medium rare. Nevertheless, the steak was of a great quality and very tasty. Sides of steamed spinach, grilled garlic & chilli flat cap mushroom, young carrots with chervil butter (all £3.25) were all nicely done. 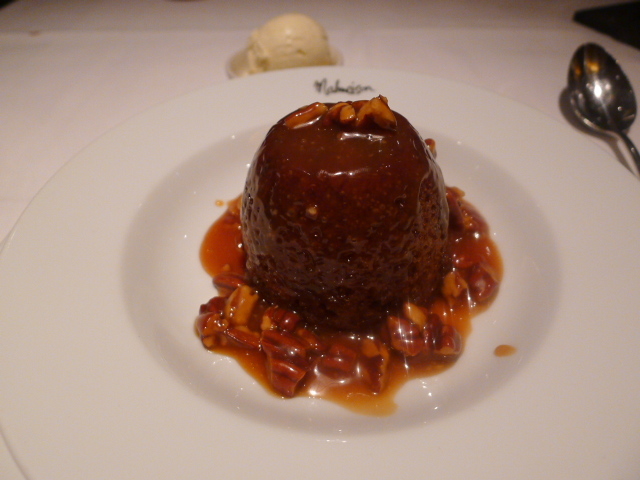 Sticky toffee pudding (£6.95) with a pecan caramel sauce and vanilla ice cream was rather yummy. The caramel sauce was rich, sweet and decadent and really hit the spot. On the whole, the food at Malmaison Brasserie was nicely done and tasty, if somewhat uninspired. The restaurant also lacked for atmosphere so it doesn’t make for a destination restaurant. But if I were staying at the hotel and looking for somewhere convenient to eat, I would have no qualms eating at the Brasserie either. We found the table service attentive, but the bar service less so. Price range: About £28 – £48 per head. Excludes drinks and service.